For enthusiasts, coffee is a full sensory experience. Does the smell of freshly ground coffee brings a smile to your face? Don’t forget the comfortable touch of holding your favorite mug. Like espresso? Just the sight of caramel colored froth atop an espresso can make your mouth water. If your like me, hearing the first cup of the day brewing in the kitchen is always my preferred alarm clock. And best of all, the taste! Oh the joy of the first sip of your delicious morning brew. Whether its your sense of smell, touch, sight, hearing or tasting, every experience with coffee is gratifying and delicious. This Sunday, I want to focus on just one of these sensory coffee experiences, what you hear. Specifically, the sounds of coffee you hear during the roasting process. When roasting coffee beans, the audio cues are very important for judging the degree of the roast. Before we can talk about what we hear, we have to talk about heat. Part of the appreciation for craft beverage comes from understanding the artisan processes required in producing a high quality product. The roasting process that transforms green coffee beans into an artisan ingredient is extraordinary. With each batch of green coffee beans being prepared for roasting, a roaster faces unique challenges. The challenges of using heat to draw out the character and flavor of the beans and monitoring changes in their taste, until reaching the desired flavor profile. 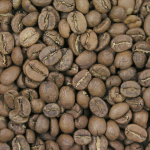 Green coffee beans contain acids, proteins, sugars and caffeine but has no desirable taste. It’s the roasting process that produces the chemical reactions of these components to create the flavors we all love so much. This chemical reaction is called the Maillard (mail-ard) reaction. The Maillard reaction is all about creating flavor. When food is heated, a reaction occurs between the sugars and amino acids. Its this reaction that turns baking bread a golden-brown, sears a delicious steak and transforms green coffee beans into roasted goodness. For most foods, the Maillard reaction generally begins around 284 to 329° F (140 to 165° C) and can create hundreds of different flavor compounds depending on how far the process is allowed to continue. Once you have heat, the next challenge is controlling the temperature. From the size of the coffee bean, the method of its processing (wet or dry) and even the type of roaster used (drum or air), there are several factors influencing the temperature of coffee during the roasting process. Sound is a great indicator for the roasting temperature. There are two points within the roasting process where what you hear becomes very important. These audible moments are called “cracks”. 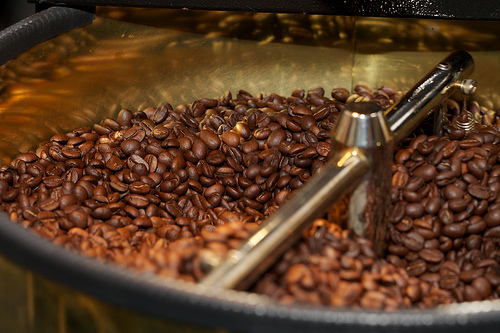 The first crack of the coffee bean comes at about 385°F in the roasting process. Hearing this first crack lets the roaster know his coffee has reached the beginning stages of “light roast”. What happens is, you start the coffee, there is an initial temperature drop. Then there is a moment called a turnaround point, now the temperature is going back up in the coffee. I’ll start checking on things around the 6-minute mark, when chemical changes are happening with the bean. At that point, the coffee changes color from green to a light yellow. The color change means that the sugars in the bean are starting to cook. From there, I can make the decision to turn the temperature down and increase air flow. Now, we will start having what’s called first crack. The bean is literally cracking like popcorn. You can continue to roast after first crack all the way to a medium roast (City Roast) at 426°F. The coffee beans now have a beautiful brown color. This is the most common color you will see when purchasing specialty coffee. As you can see, there is a lot to appreciate about coffee! So this Sunday, as you enjoy the flavor of your favorite brew, take a moment to close your eyes and listen closely for the “crack” that made it all possible.